We developed the AGRU-8 for our customers who found they needed more storage and recovery capacity than smaller handcart mounted units, the AGRU-8 is available without the bulk and high price of a large skid or trailer mounted unit. The equipment is designed for use in field service of insulated metal clad switchgear, bus ducts and individual circuit breakers. The AGRU-8 SF6 Gas Servicing Cart shall be fully assembled on a two-wheeled heavy-duty handcart, which shall be sufficiently braced to minimize vibration. Handcart will be complete with lifting eye, hose hook and power cable storage. Recover, purify and store SF6 Gas from the switchgear to the storage tank. Pressure regulated recharging of SF6 Gas to the switchgear from the storage tank. Evacuate SF6 Gas from the cart to an external storage tank for maintenance purposes. 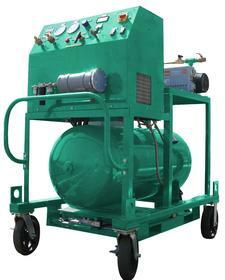 Three (3) High Pressure Single Stage Direct Drive Oil-less Compressors capable of producing pressures of 70 bar. Compressor motor 1/2 kW, 3450 rpm. Compressor has metal valve construction. 6.6 m3h-1 displacement (60Hz). Nine discharge check valve, brass, prevents high pressure going back to compressor when performing a low-pressure equalization. One High efficiency, 4-pass, air-cooled SF6 condenser to aid in liquification of SF6 at higher ambient temperatures. Blank off pressure: 0.08 mbar. Pump also includes: positive antisuckback valve, isolation valve, gas ballast, and automatic oil return system. Cylinders secured onto a tray and manifold, in order to store up to 156 kgs. of SF6 in liquid form indefinitely, at ambient temperatures of less than 114ºF (45.5ºC), without the need for refrigeration. The AGRU-8 shall come equipped with an external storage port, to which any SF6 Gas cylinder or tank rated at 40 bar minimum) can be attached to allow for unlimited storage of SF6. All storage tanks shall include an isolation valve, and an approved safety relief valve. Designed for pressure, temperature and flow. Bronze body with Teflon seats and seals, quarter turn. One Pressure Regulator, Brass body, 0-7 bar spring, to allow for safe regulated filling of SF6 equipment. Two Permeation Rubber Resistant Hoses: 12 mm I.D. X 4.5 meter. Long, complete with quick disconnect self-sealing end fittings. Hoses will be suitable for system pressure, temperature and flow. - An optional SF6 Cylinder, Size H - 52 kg., with CGA 590 valve connection with no check valve, 99.9% dry can be provided. The AGRU-8 has a capacity to hold 3 bottles on board to give a total storage capacity of 156 kgs. - An optional SF6 Storage Tank, 300 litres (300 kgs. 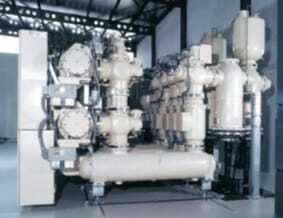 ), can be supplied to increase the storage capacity of the AGRU-8. 300 W storage tank heater. Heater comes with its own power cable and has a thermostat preset at 125 ºF (52 ºC) and is protected from overheating by a thermal cut-off. The heater maintains an even temperature for a constant positive pressure that speeds up the charging process. An optional electronic cylinder weighing scale to monitor the filling of the SF6 cylinders. Weigh scale system comes complete with an adjustable maximum weight set point and includes a weighing system and cylinder mounting bracket. Unit can be supply with 6m. hoses instead of 3m. Do you want to buy high quality SF6 gas servicing equipment? 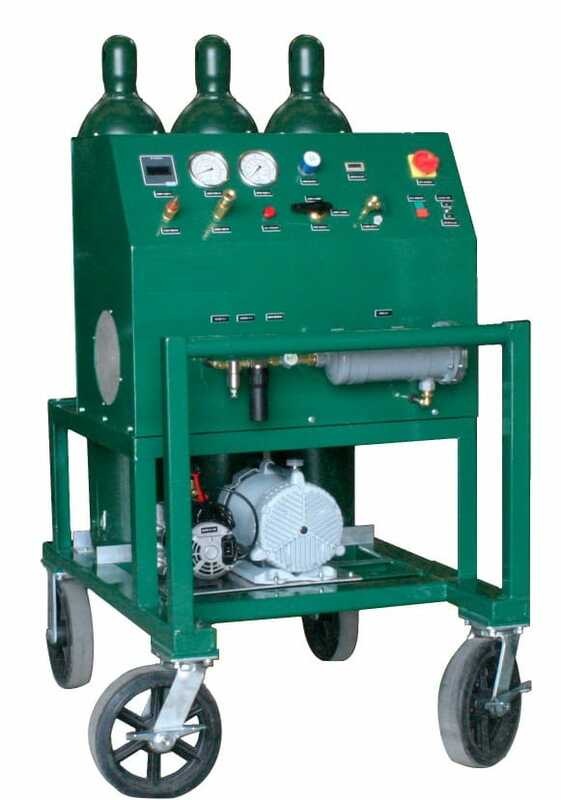 Inquire for our SF6 gas servicing equipment prices. Do not hesitate to contact us, call us today by phone (+34) 982 20 99 20. We are happy to help you.